What makes this combination of items perfect for happy hour with girlfriends? It has everything you want to look cute in front of your friends! A great bag, shimmering jewelry, and a fun print with the poncho! What would you say is the most important item to have in order to transition your work look to a girl’s night look? Keep an awesome clutch in your work bag! Use it as a wallet during the day, then in the evening, put in your essentials and you’re good to go! What’s your favorite thing about happy hour and why? I love the atmosphere! Everyone is relaxed because they’re off work, there are usually specials as far as prices, and you can get to know coworkers outside of the office. I love the show-stopper necklace! It gets you noticed, it sparkles and it’s just plain fun! I love the idea of wearing a belt that coordinates with the shirt and a fierce pair of high heels. It’s also nice to be able to wear your shoulders out which may not be appropriate for the office but perfect for happy hour. 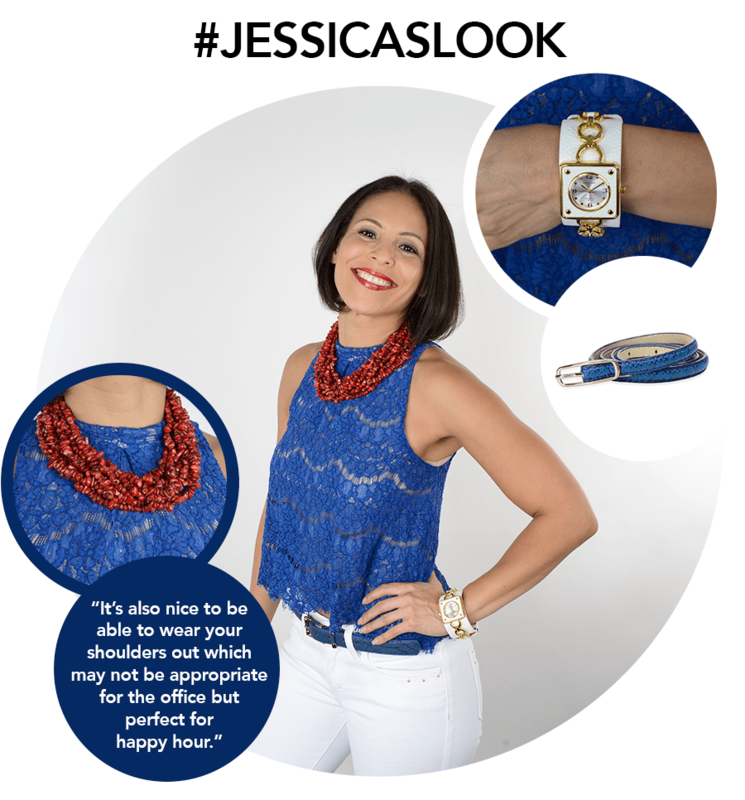 The necklace also takes the outfit to the next level from day to night. A fabulous pair of high heels! I enjoy spending time with friends and family. I love catching up with everyone, I think it’s important to let our hair down and take some time out for ourselves. I love white watches, especially during the summer season. It’s a fresh look and is a simple way to wear color. The best part about the Look of the Week is that you can get all of these items at the LC! Now that you have seen two ways look amazing with the girls, which is your favorite? Use the hashtags #JESSICASLOOK and #KELSEYSLOOK on Twitter and Facebook to cast your vote!